The first step in developing a perimeter defense plan is not doing a little math to figure out how much fencing must be purchased. Nope, first you need to clearly outline what you must defend. That might seem like a pretty straight forward concept, but each little details not only matters, but impacts the “how” part of the prepper retreat or bugout location perimeter defense plan – and your survival. Think of perimeter defense like a winding row of dominoes. If one falls, all the rest will as well. 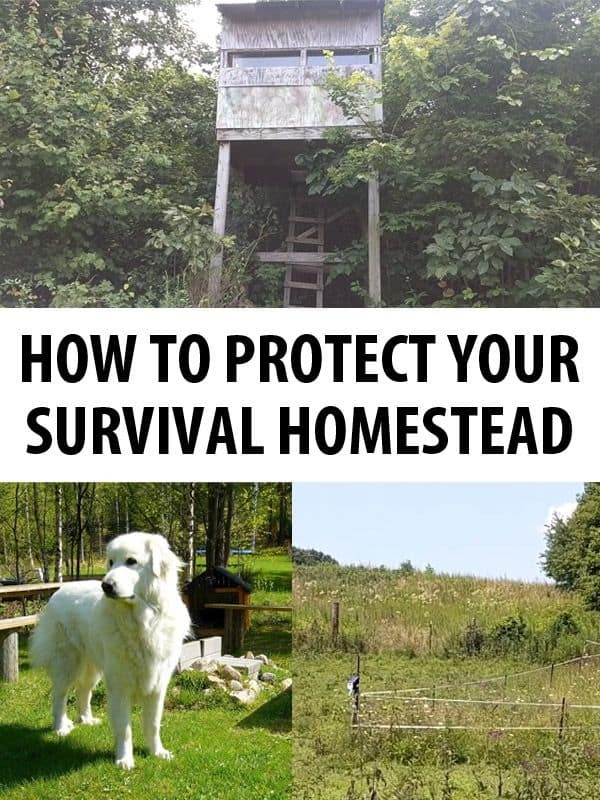 What each prepper needs to protect will vary depending upon the acreage, terrain, and location associated with the bug-in location. Writing down everything that you want to keep alive and protected, will help put it all in perspective and serve as the foundation of your perimeter defense plan. If any one of the items on that list fail to be protected, you could go from being a survivor to a doomsday disaster statistic in mere weeks…or days. Your perimeter defense plan is like an onion, it must have layers. Once you have determined what must be protected, it is time to evaluate your property, home, and other structures and storage areas to rate how vulnerable they are to intruders. Although it is outside the scope of this report, reviewing the structures and storage areas on the property to ensure your family and your preps are not vulnerable to fire and other havoc the elements can wreak as well (flooding, tornadoes, etc.) will also help harden your bug-in location. The primary goal of any perimeter defense plan is to keep people off of your property – period. But, making it as difficult as possible to get inside a door, window, coop, or hutch, just might buy you the time you need to prevent the unwanted invader from making off with your preps and livestock. OPSEC (operational security) is at the cornerstone of prepping. If you do no live in a secluded area, your perimeter defense plans could basically ring the dinner bell for the marauding hordes if you do not camouflage then so they blend in with either their surrounding environment or what is common in your area – preferably both. Unless you can afford to build a fortress and stock it with well-trained protectors who have ample ammo at their disposal, discretion should be used when devising your perimeter defense plan. You should also train protectors of the four-legged variety to help patrol and serve as an early warning system around your bug-in location or survival homesteading retreat. Ideally, you want folks going by your home to not notice how well-protected it actually is during pre-SHTF times. Do as little to attract attention to your perimeter defense system as possible. This task, as with everything except finding a close by hospital or specialized medical care, is best accomplished in a rural area. Create listening posts and observation posts around the perimeter of your property. These covert or environment/society blended structures will offer you a sightline not only around your own property but of the nearby roadway or neighborhood. Your LP/OPs can (and should) be a combination of lookouts that intruders are able to see and go entirely unnoticed, as well. The listening posts and observation posts can also serve as temporary living quarters if members of your survival tribe will be stationed at the perimeter checkpoint overnight. Stock the space with necessary survival gear, tools, and long-term storage food. Burying a survival cache nearby and venting the roof so a camping stove could be used during extended stays inside the post, is also recommended. If space is limited inside your home and the members of your survival group do not have campers to set up for SHTF lodging, the LP/OP could be insulated and a small wood stove installed so the space could double as permanent living quarters – but the location will no longer be covert if the woodstove is used for heating and cooking purposes. 1. Invest in quality and multiple locks for both your doors and windows. 2. Put battery powered alarms on your windows and doors and make stocking up on batteries (and ample replacement alarms) a budget priority each payday. 3. Buy emergency fold out ladders that are designed to be used for second story escapes during house fires and/or repelling gear to help you flee an urban apartment if using the fire escape is not an option. 4. Get a dog, a real dog, not a tiny little thing that can be carried in a purse or curl up in your lap. Engage in guard dog training with the canine. Get a pair of guard dogs and train them well. Some dog breeds are prohibited on specific insurance policies. Review the list your carrier has before purchasing a dog. If you live on a large acre survival homesteading retreat, consider working a pair of herd dogs into you perimeter defense plan as well. A top quality herd dog, like a blue heeler, will learn to round up your livestock on command or when a threat is near. Should the livestock find a way through a section of fence, which is to be expected with homesteading life (especially in the fall when the deer are running hard) you will want the quick help of herd dogs getting the livestock back where they belong, before someone else decides to make your cow their dinner or your horse their new mode of transportation. Fence in the entire property. This can be problematic depending upon homeowners association rules and possible existing and shared fencing with neighbors. You do not want privacy fencing, it creates too much of a visual barrier for you – aiding the invaders by keeping their presence hidden. If you cannot tear down privacy fencing now or use chain link, vinyl slat, or wood slat fencing in your neighborhood, buy it anyway. After the SHTF you will no longer have to worry about homeowners’ association rules. Be prepared to tear down privacy fencing as quickly as possible and replace it with chain link fencing. Ideally, you should move a few inches inside your property line and install the fencing next to existing fencing. Sure, this would look rather off to visitors and workers who come on your property but you can blame the double layer of fencing on pets that keep getting out via loose boards or burrowing under the shared fencing. When we still lived in a small town before buying out 56-acre survival retreat, we had enough wire fencing, barbed wire, and tall poles to erect a fence around our three lots. The barbed wire would have been installed prison fence style above the wire fencing to create a tall barrier that would have been painful to get through yet still allow for full visibility to detect intruders. We also networked with neighbors to develop a plan to position cars at each end of the block and at the alley entrances to prevent non-residents from access by vehicles. Stockpiling similar materials can help to better protect your suburban home after the SHTF, but it will definitely alert other residents that you just might be a prepper. You do not want trees, bushes, and brush to grow tall like the ones in this video and block your view from the road if you live in the suburbs, a small town, or on a small acreage rural property with road frontage near the home. The little good it does to block what you have and are doing, from public view is not enough to make up for the direct line of sight you are losing against potential intruders who could be quietly gathering and planning their attack. Use barbed wire, lots and lots of barbed wire. We have multiple rows of five or six strand barbed wire fencing both around and throughout our survival homesteading retreat – and it all blends in naturally to the landscape and typical rural farm set-ups in the area. In-between the rows of barbed wire, we make use of natural fencing to create another entry barrier. Wild blackberry bushes have been allowed to grow and expand in all directions to create a painful entry point for any potential intruders. I also recommend using copious amounts of gates to give you easy access to the entire property. This will also allow you to rotate your livestock around into various pastures and divide them from the hayfields and gardens. You cannot see our home from the road, it sits more than a half mile back in the woods, but if you could, it would be impossible to tell we have established a hayfield on the back and most unreachable area of the property from our “one way in, one way out” driveway and a spacious paddock around the barn so the livestock can be kept far from view during a long-term disaster. Sure, folks who have driven by our out-of-the way country road (if it had not been closed for four months with no real prospect of being repaired – we currently live right in the middle of two road closed signs with only one other house in the same vicinity) could recall we do have livestock if they happened to see them in a lower pasture, but they would have to go through a lot of dangerous hurdles to reach them after the SHTF. Plant living fencing in your front yard by the road to also create a dense barrier between your and potential invaders. Such fencing will need to be maintained so it does not grow so large that you cannot see over it. Some types of natural fencing can also be used as a nearly year round food source for your livestock. One of the many reasons we chose the land we purchased was because of the creek that runs through it – a top priority during a property search for most preppers. Our creek is so small that it does not even appear on a map, but it does connect to larger creeks and a state park fishing lake. We do not want non-tribe members to have access to our creek, so we have taken as many pre-SHTF preventative steps as possible to reduce the workload once doomsday strikes. Posts have been driven into both sides of the creek as it flows through our property. Barbed wire already cut to fit is at the ready in tubs stored nearby so it can be strung across the creek, wrapping it both low and high around trees and bushes, before reaching the posts. Sinking locust corner fence posts in the middle of the creek is also a likely future step we will take if disaster strikes. Land which boasts a natural water feature is always a massive plus, that is why some preppers choose to live next to a lake or river. While there is nothing you can really do to prevent traffic on a large body of water, there a steps you can take to prevent boats and swimmers from coming close to your portion of the shore – at least when rule of law is no longer a consideration. • Too many trees around the property perimeter. • Home built out of materials that could easily be comprised by an intentional brush fire from beyond the property. • Trees close to your home can be used at hiding spots, covert viewing areas by attackers, and increase the potential risk for fire taking the home either accidentally or via arson. • Barns and outbuildings both large and small situated close to your home offer not only a hiding spot and clear view of your belongings and actions, but also allows attackers to have during a firefight. • Dense shrubbery around the perimeter of the property – if that area offers easy access to your property or the home is near a road. Like trees, the shrubbery also gives potential attackers a place to hide from view while they scope out your prepper retreat. Building traps, pits, and exploding targets can also be used in a highly effective manner to deter unwanted visitors to your bug-in location. How legal it will be to create some of these deterrents, at least before the SHTF, will depend largely on where you live. In addition to using DIY road spikes to block your driveway, consider putting them along the entire perimeter where potential attackers would walk or drive an ATV to garner access to your property. The road spikes can also be a superb deterrent when placed around your LP/OP or sniper’s nest – and below windows to the home. If you live on a large rural survival retreat, cut some logs in advance and place them along the sides of your private farm road or driveway so they are ready to be placed across the road to prevent vehicles from being able to drive upon it. Harden your actual home as a backup to your layers of perimeter defense plans. • Replace the standard glass in your windows with a hurricane or bullet resistant grade. Add reinforced metal shutters and/or wrought iron bars over the windows – or have them in place to be affixed quickly when disaster strikes. • Invest in solid wood, or preferably solid wood covered by heavy metal, doors. • Replace your existing roof with a metal roof to vastly reduced the chances of being burned out of your home. • Build a protective and non-flammable “fence” around your chimney to reduce the chances of attackers being able to gain access through it or drop an explosive device, etc. into the opening to run you out of the home. • The most hardened (at least from a non-millionaire standpoint) homes are constructed out of poured concrete or cinder block foundations and walls. This type of building material will not only prevent arson from forcing you out of your home, but will be more difficult (but definitely not impossible) to shoot through. • find more ideas here. Perimeter defense needs as well as feasible actions will be dictated by the type of property and your budget. Do not become overwhelmed or go broke trying to complete the SHTF hardening project. The most important aspect of this survival project is to complete a detailed review of your property and then craft an equally detailed plan – complete with a budget and timeline, and start working.